Someone asked me the other day when I'm going to run out of things to write about. To be honest I have yet to have that problem - there's usually too much rather than too little. But as one writes more (1612 posts and counting) it's nice to work on bigger projects that take more work, but derive greater satisfaction. It's something I am able and can afford to do - and I intend to take advantage of that luxury. 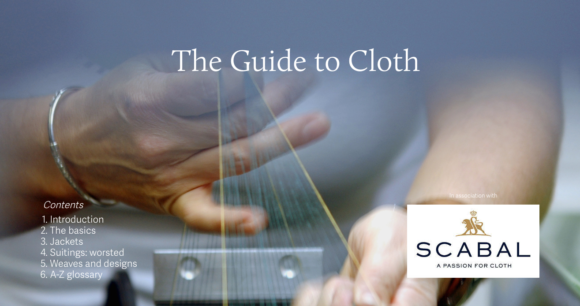 It was with this in mind that I embarked on the Guide to Cloth project with Scabal. So far there are six posts in this series, and it will grow consistently over the next few months, adding to and referencing itself, building up into a unique guide to the lovely fabrics we wear every day. These posts needed a single home, rather than relying on search engines and category pages. So today we launch the Guide to Cloth microsite - a host for all these articles as they grow and expand - as well as a link in the nav bar to direct people to this new resource. The page can be seen here. Watch it grow. You can follow the discussion on The ‘Guide to Cloth’ microsite by entering your email address in the box below. You will then receive an email every time a new comment is added. These will also contain a link to a page where you can stop the alerts, and remove all of your related data from the site. This is excellent! You keep finding new ways to outdo yourself Simon! No immediate plans, no. I’m sure I will at some point though. I have looked at Pecora Ginza! Question: When you create a new cloth post that will be on the micro site, will it be mentioned in some form as a brief post or otherwise on the main site, or will readers need to check this separate site directly?